Methadone Maintenance Therapy – Addiction knows no barriers. Patients come from all walks of life and background. Patients seeking our service are welcome, and will be treated with respect and dignity. 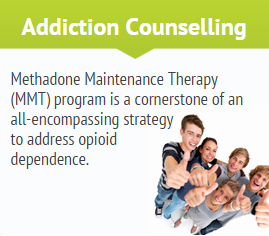 Our addiction treatment, Methadone Maintenance Therapy (MMT) program is one of the cornerstones of an all encompassing strategy to address opioid dependence, its consequences and its prevention. Health Canada has clearly indicated that MMT apart from reducing the use of opioid and other substances also prevents criminal activity and mortality… it has been shown to help save lives! MMT helps improve pregnancy and overall health by helping patient retention & treatment compliance. It improves overall quality of life and truly catalyzes the achievement of a physical, mental and social well-being. We understand the social, personal & financial issues which come with addiction and we try to deal with them seeking solutions “head on” rather than hoping that they will go away on their own. The GOAL of our clinic is to enhance the community in which we are located by providing a comprehensive and integrated treatment service for opiate-dependent individuals in a community-based setting. We seek harm reduction for our clients and our community. Our offices are located in Hamilton, Toronto, Ontario and the surrounding areas. Contact Towards Recovery on 519-579-0589 to locate your nearest clinic and kick start your journey. Make sure you have an unexpired OHIP card or call 1-866-532-3161 to find out how to get one. Don’t hesitate to call us! We’ll be happy to help you.